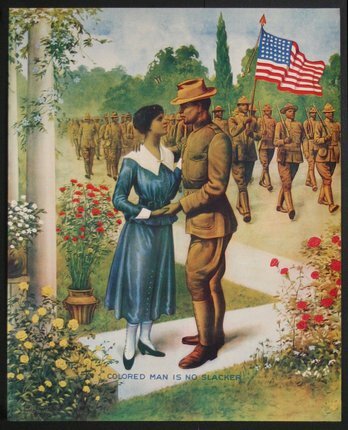 "World War I recruiting poster aim[ed] to encourage African Americans to enlist. . . "Colored Man Is No Slacker," a black soldier takes his leave against a background of African American patriotism, self-sacrifice, and courage. . .More than 350,000 African Americans, trained and deployed in segregated units, served in the US military during World War I, of whom 42,000 saw action in Europe. (text-source: 1918. E.G. Renesch, Chicago Freshest example we have ever seen ! Slacker definition: a person who evades his or her duty or work.